The rigid American telecommunications services sector is about to undergo a significant change as the major mobile network service providers abandon phone subsidies and the previously required 2-year contracts for subscribers. The most apparent effect is likely to be many more consumers will choose to keep their working smartphones for a longer period, and fewer people may be able to rationalize the full cost of a new premium smartphone. That being said, it's highly likely that mobile operators are also going to see more customer churn, as smart people shop for better deals and consider alternative offers. T-Mobile seems to be in the most advantageous position as this trend unfolds, with Google Project Fi also potentially gaining market share. Meanwhile, the smartphone market in North America should witness greater demand for affordable (significantly lower-cost) new devices. This trend will favor the rising Chinese smartphone vendors. In contrast, the vendor likely to be negatively impacted would be Apple, as more mainstream consumers question the benefits of owning a high-cost iPhone. 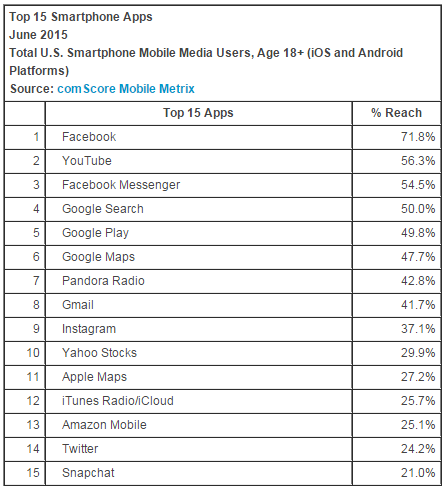 comScore released data from their latest report of the key trends within the U.S. smartphone industry for June 2015. Apple ranked as the top smartphone manufacturer with 44.1 percent OEM market share. Meanwhile, Google Android led as the number one smartphone platform with 51.6 percent platform market share. 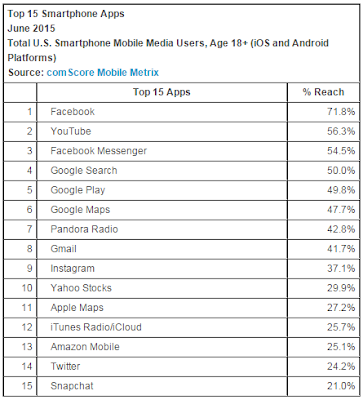 Facebook continued to rank as the top individual smartphone application. 190.3 million people in the U.S. owned smartphones (76.7 percent mobile market penetration) during the three months ending in June. Apple ranked as the top OEM with 44.1 percent of U.S. smartphone subscribers (up 1.5 percentage points from March). Samsung ranked second with 28.1 percent market share, followed by LG with 8.3 percent, Motorola with 4.9 percent and HTC with 3.4 percent. Android ranked as the top smartphone platform in June with 51.6 percent market share, followed by Apple with 44.1 percent (up 1.5 percentage points from March), Microsoft with 2.9 percent, BlackBerry with 1.2 percent and Symbian with 0.1 percent. Facebook ranked as the top smartphone software app, reaching 71.8 percent of the app audience, followed by YouTube (56.3 percent), Facebook Messenger (54.5 percent) and Google Search (50 percent).